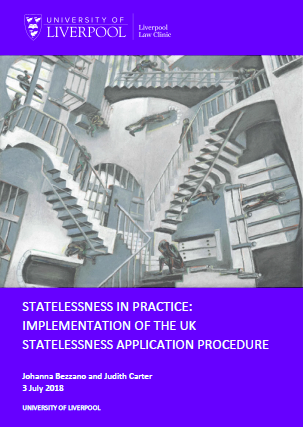 Johanna Bezzano and Judith Carter of the Liverpool Law Clinic at the University of Liverpool yesterday launched an important new report looking at the implementation of the UK's statelessness application procedure. You can read a copy of the 48-page report here. It is intended for policy makers, legal practitioners and people affected by statelessness. Drawing on actual decisions made by the Home Office, the report details some of Liverpool Law Clinic's findings on how the procedure for statelessness applications is working. With a team that includes four immigration and asylum lawyers, Liverpool Law Clinic says it believes it has the largest caseload relating to statelessness leave applications. It has made or assisted with 33 statelessness applications over the past two years alone. Liverpool Law Clinic began its work assisting stateless people in 2013 when the Home Office introduced a procedure for people to request leave to remain in the UK on the basis of their statelessness. In 2016, the Clinic began a dedicated casework research service, which broadened its casework considerably and helped it develop a better understanding of trends and developments in statelessness cases. Decision-making is inconsistent and at times poor. This is compounded by the lack of legal aid and the absence of a statutory appeal right. Particular problems have arisen with basic country information. It is unclear how the Home Office interprets "shared burden", in particular when it takes steps to investigate a person's statelessness through interviews or enquiries. Its guidance is reasonably clear but we do not always see this reflected in practice. There is a lack of Home Office guidance addressing related applications involving stateless persons. There are delays in processing claims – especially those of adults without dependent children. Cases can be outstanding for periods in excess of 20 months. A lack of legal aid means many applicants do not have legal representation. This makes it difficult for people to make informed decisions about whether or not statelessness (or another) claim is most appropriate. It also means that applications are neither prepared nor evidenced as well as they could be leading to more refusals and repeat applications. Lack of appeal right means that there is insufficient judicial scrutiny. Administrative review is not a sufficient remedy as it is limited in scope and conducted internally. Judicial Review does not commonly require the court to make factual findings, but the facts are often in dispute where there is a contested statelessness decision. It is also is expensive (for both sides), slow, sometimes opaque, and difficult to access. There are links between trafficking and statelessness cases. The statelessness applications process and the National Referral Mechanism (NRM) processes do not always work well together for the benefit of stateless victims of trafficking. There are deficiencies in the entitlements of individuals in the statelessness application procedure. It is not clear that they are entitled to Home Office accommodation and support, they are not exempt from charging for secondary health services and there is no provision for permission to work. There are deficiencies in the entitlements of individuals who have statelessness leave. The initial grant of leave is 30 months. They are not eligible for home student fees or student finance, which means university level study is inaccessible. They are not exempt from charging for secondary health services, they are not eligible for social housing and they are excluded from making claims for criminal injuries compensation. While Liverpool Law Clinic says the UK is ahead of many countries in having a statelessness application procedure, it concludes that the procedure is not working as well as it could and is failing some applicants. The report finds: "Decision-making is chronically slow and some decisions are flawed. Where decisions are flawed, the available procedures to challenge them are inadequate. Many statelessness applicants do not have access to any legal advice because of the limits on the provision of legal aid. A combination of these factors means that we see resources being wasted though cases being 'recycled' by repeated Home Office rejections rather than resolved." Liverpool Law Clinic sets out 19 recommendations in the report as to how the problems identified might be resolved.